Bengaluru, Jan 5: One of the long-standing demands of Hajj and Umrah pilgrims and the large Kannadiga diaspora in Saudi Arabia for a consulate in Bengaluru is likely to be fructifying shortly. 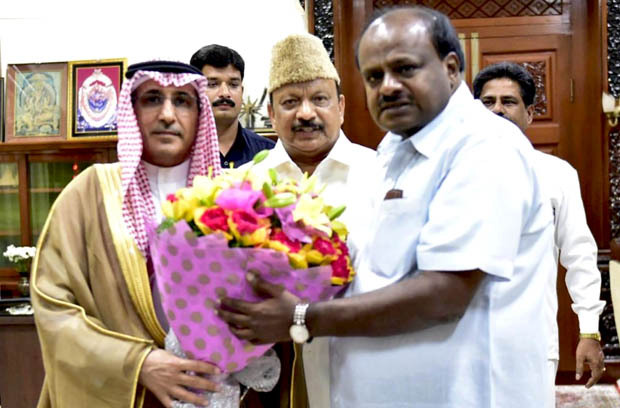 Saudi Arabia’s Ambassador to India, Saud Mohammed Al-Sati, who was in the city on Tuesday, is learnt to have told chief minister Kumaraswamy that work on establishing the consulate is in progress, and it is waiting for approval from the Ministry of External Affairs (MEA). The ambassador said that the number of people seeking a visa to Saudi Arabia had doubled, and that it was the reason for opening a consulate. Currently, residents of Karnataka have to travel to Mumbai for the paperwork. Around 50,000 pilgrims travel from Karnataka annually for Haj and Umrah. This is apart from a large number of people employed in Saudi Arabia.